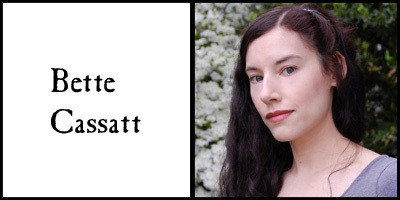 Bette Cassatt (D'Artagnan) relishes playing roles that make use of her stage combat training. Previous roles with "fights" include: Incorruptible (Maria), The Cripple of Inishmaan (Helena), Caesar the Watchdog of the Castle (Caesar), Bushwa (Insurgent), An Experiment with an Air Pump (Maria), The Lion, the Witch, and the Wardrobe (White Witch), Macbeth (1st Murderer), A Midsummer Night's Dream (Hermia), Beware the Battagiole (Bella), Ninja Motorcycle Babes (Mary) and stunts for America's Most Wanted and the film Confinement. She is currently in-production for a Victorian era film (with Piranha Pictures), where she gets to swing around an axe. Bette has also performed fights at such places as The Kennedy Center, The Folger Shakespeare Library, The National Theatre, The Women in the Arts Museum, and The Shakespeare Theatre.